When I was young, I discovered the simple beauty a crayon could create. As I dove more into this dicovery, I learned there were many different forms of art waiting ahead of me. Being young, I stepped mainly into art with crayons, markers, colored pencils, children’s clay, and on occasion paint. Art was brought into my life and before I knew it, I was falling in love with the different gifts provided by my new talent. It didn’t take much time for me to feel a need to continue creating anything I could. That need is a need many artists find when they discover a unique form of beauty only a pair of hands can make. All an artist needs is a little push to tell them to get going. Art was a way for me to express my quiet, shy, timid self without opening my mouth. It was all I ever knew. But as time ticked by and age began to stack on my life I learned the truth: It takes a lot of work and a dash of luck to make it in our world as a successful artist. With a sad heart, I chose to drop my artist dream. What did I choose to replace my art career? Becoming an author! Well, that also falls into the creative aspect of my mind, but once again it is not a career to guarantee success. Being an author holds the same traits as being an artist. In fact, I believe writing up a story is simply another form of art. Rather than piecing together colors to create an image for all to see, an author is putting together words to make an image in a reader’s mind. Writing up a story’s image is another form of art. This art may even be more beautiful to some than a picture on a page. Thankfully, I believe my first novel, Curse Under The Moon was written well all things considered. The idea was beautiful to me and easy for my creative mind to finish off. Of course, when the novel was finished I couldn’t step away. One piece wasn’t enough and soon the single book became the first book in a three book series. Curse Under The Moon was soon followed by Jump Over The Sun then Hidden In The Stars. I finally crashed down the door my creative mind needed to be opened. These novels are placed in order from left to right with first book of The Lyall Pack Series all the way to the third book. 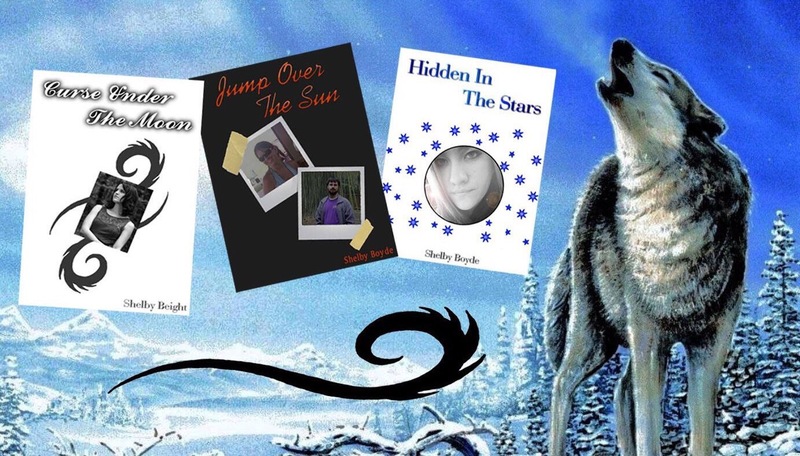 These novels are available through Amazon.com. I couldn’t believe it. Not only had I published a single novel, but I had an entire series available. But it wasn’t enough. I wanted more. Sadly, writing is not like snapping our fingers. We can’t just start simply because we want to get something going. Instead, I stepped away and remained silent on the writing front for a little while. Thankfully, I discovered Etsy and the art door I locked in my earlier years was kicked down. I opened my own Etsy shop titled, ShelbyBoydeArt. Now I have another way to get my creative mind working and getting some attention sent my way. It’s a great method for me to clear my mind when I can’t focus on whatever writing project I’ve thought up. It’s great how one source of creativity can help me clear my mind for my other source of creativity. I never thought my dreams in art would be possible. Now I know it’s foolish to think everything is impossible. My different careers allow me to focus my mind on two forms of work I love, and I couldn’t ask for more. It’s not always easy, but it’s always fun. In what ways are you creative? Do you write, draw, cook, act, or do another form of art?